In the course of the reduction process, the KDF cartridge (highly pure copper-zinc formula) exchanges electrons with the contaminative substances. The removal and addition of electrons turns most contaminative substances into harmless components, e.g. : chlorine into chloride. The cartridge binds the remaining contaminative substances (lead, cadmium and other heavy metals). In the course of electrolysis, lead is bound by copper, while cadmium is bound by zinc. 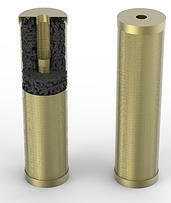 Eventually, the filter capsule eliminates 99% of chlorine and 90% of iron and heavy metals. The filter can purify cold as well as hot water. KDF’s certificates and laboratory test results can be viewed at . 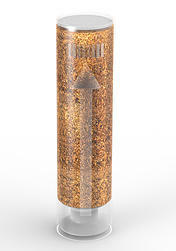 Each Spa Filter Capsule can be used for up to 3-4 months! This period may of course be longer or shorter depending on water quality and frequency of use. The condition of the capsule must be checked regularly! In each case of replacement the capsule after the insertion of a new capsule, at least 10 seconds let drain it by the tap water to the capsule to be sufficiently washed.Thereafter we will get a clean filtered water. The capsule is made of medical PE and the cartridge contains 50% KDF 55 Medium and 50% silver coated activated carbon granules. These two special materials ensure perfect filtration in applications where you need to filter and purify water contaminated by heavy metals and various types of bacteria. It filters and kills bacteria and fungi. 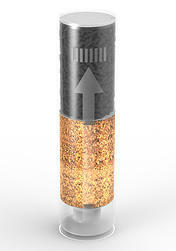 The capsule is made of medical PE and the cartridge contains 100% silver coated activated carbon granules. It is recommended for water filtration where unwanted odours, flavours and other organic matters need to be removed from tap water. It filters and kills bacteria and fungi. Spa AgCarbonFilter Capsule can be used for up to 3-4 months! The capsule is made of 100% PA-lined brass, which provides such a large filtration surface that it multiplies the efficiency and life expectancy of conventional KDF filters. The cartridge of the capsule contains 100% KDF 55 Medium. In this case filtration aims to remove chlorine and heavy metals. 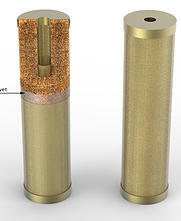 The capsule is made of 100% brass, the cartridge contains 100% silver coated activate carbon granules. In addition to being an efficient filter (eliminating unwanted flavours and odours), it also kills bacteria and fungi, preserving the useful minerals and enjoyability of water. When the colour of the brass turns brownish black, the capsule must be replaced. 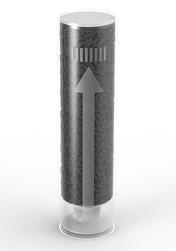 The activated carbon cartridge is able to purify water from the microscopic contaminative substances such as detergents, pesticides, phenol compounds, oil derivatives and other organic matter (various types of unwanted flavour and odour), haloform compounds; to remove the chlorine content of the water, to bind its free active chlorine content. Compared to standard activated carbon, silver loaded activated carbon (due to its silver content) is able to prevent the proliferation of live organisms settling on the organic matter precipitating on the carbon surface. The filter can purify cold as well as hot water. Besides, it further enhances the excellent capabilities of KDF. All SPA capsules must be stored in a dry, cool place before they are installed.